Here are my IDP Linebacker Rankings for Redraft Leagues. I will continually update these rankings throughout the off-season to reflect changes in free agency, defensive schemes, defensive playing time, rookie draft selections, etc. I would love to get feedback from my readers. Often times, we get stuck in our own philosophies and tendencies. So, it's nice to get a different perspective on things. Your comments will definitely influence my rankings. Linebackers are undoubtedly the staples of a fantasy defense. However, I believe many owners often times misjudge value at this position. If you aren't able to grab a "Tier 1" or "Tier 2" linebacker, then I would wait on drafting a linebacker until the later rounds. In my scoring system, the difference between the 2nd leading point scorer for linebackers, Jon Beason, and the next highest scoring linebacker, James Laurinaitis, was 51 points. Conversely, only 51 points separated Laurinaitis from the 25th ranked linebacker Dhani Jones. This stat shows that after the 1st two tiers of linebackers, the fantasy production is very similar. Hence, why my "Tier 3" is so large. In addition, IDP studs always emerge at the linebacker position during the early part of the season (e.g. David Hawthorne, Brian Cushing, Clint Session, Stephen Tulloch, etc.). With this being said, I sometimes like to have a player at linebacker who I feel is expendable in order to pick up a potential linebacker stud off of the waiver wire during the season. 1. RILB Patrick Willis (SF) - Willis is the obvious number one linebacker heading into the 2010 season. In his first three seasons in the league, he has averaged 120 solo tackles, 36 assists, and 3 sacks. You won't find a more consistent and reliable linebacker then Pat. 2. MLB Jon Beason (CAR) – For some reason, some IDP owners have lost a little faith in Beason. I haven't at all. He played most of the season injured and he still registered career highs in total tackles, sacks, and INTs with 142 total tackles, 3 sacks, and 3 INTs. He's the best fantasy linebacker not named "Patrick Willis." September 1 Update: Although Beason has been moved to the weak side, don't expect a dip in production. Carolina runs a ton of cover-2 schemes which generally funnel plays to that side of the field and therefore his tackle opportunities should remain aligned with previous seasons. For more in-depth information on Paul Posluszny, click here. 4. MLB James Laurinaitis (STL) – I was really big on Laurinaitis coming into the 2009 season. He plays in a position in St. Louis that has proven to be very fruitful for fantasy owners over the last several seasons. Will Witherspoon, a mediocre fantasy player in my opinion, put up solid fantasy numbers there for years. Laurinaitis is much more talented than Witherspoon and it showed this season. With a full year under his belt in the NFL, Laurinaitis should be able to improve upon his top 6 2009 numbers. 5. MLB Barrett Ruud (TB) – Over the last three years Ruud has proven to be one of the most consistent fantasy linebackers in the league by averaging 131 total tackles per year. When drafting linebackers early, I look for reliability and consistency and this is what Ruud brings. 6. MLB Curtis Lofton (ATL) - I don't have Lofton ranked as high as others do because he showed some signs of wearing down over the last four games of the season. Lofton started the season out hot and was a top five linebacker. However, he finished as the 16th best linebacker in my scoring system. I like that he is a 4-3 MLB because they tend to produce the most consistent fantasy results and Lofton is still young and last year was his first year as the leader of the defense. With this being said, he should be able to improve upon his 2009 totals and be a top 8 linebacker next season. 7. RILB David Harris (NYJ) – Many fantasy owners were slightly disappointed in Harris’ production last year and I can’t figure out why. He had 131 total tackles and 5.5 sacks (both career highs). His production did slightly fall off towards the end of the season, but he was playing through an injury. He still finished as a top eight linebacker in my scoring system and should thrive under the tutelage of defensive mastermind Rex Ryan. 9 (10) . RILB Karlos Dansby (MIA) – I expect Dansby's production in Miami to be even better then it was in Arizona. He has even less competition for tackles and he will be playing in under the same defensive coordinator (Mike Nolan) who made fantasy studs out of Patrick Willis, Donnie Edwards, and D.J. Williams. In addition, he seems to be getting better with each coming year which makes him a great dynasty selection. 10. RILB D.J. Williams (DEN) – Many IDP websites project Williams as a low LB1/high LB2 and I agree with this projection. Williams finished as the 10th best linebacker in my scoring system and he was a very consistent point scorer throughout the year. However, Williams doesn't produce a ton of big plays. Essentially, he is slightly more productive version of Patriots linebacker Jerod Mayo. 12. LILB Ray Lewis (BAL) – I really don’t care that Lewis will be 35 entering into the 2010 season. Did you see this guy in the playoffs last season? He looks like he’s 25. I have owned Lewis numerous times in my ten years as an owner in IDP leagues and he’s never let me down. Lewis may fall in drafts because of his age. If he does, he's gonna be a great middle-round value. 13. RILB Jerod Mayo (NE) – Mayo is one of the most consistent fantasy producers in the league and although he doesn’t have the highest point ceiling, he doesn’t have a very low floor either. There isn't much competition in New England's front seven for tackles, so Mayo's production should remain relatively constant. He's a fairly safe bet for 95-100 solo tackles. If you’re looking for a pick with little risk, Mayo is a great option. 15. WLB Lance Briggs (CHI) – Briggs has been outperforming Brian “Big Name” Urlacher for years as far as fantasy production is concerned. Over the last six years, Briggs has averaged 94 solo tackles and 22 assists. With Urlacher coming off an injury and another year slower, Briggs should remain the solid IDP producer he has been for the last several years. 16. MLB Jonathan Vilma (NO) – VILMA!!!!!!!!!!!!!! I thought Vilma had a pretty good year considering the New Orleans defense wasn’t on the field a ton this year and, when they were, teams were usually passing to play catch-up. Vilma doesn’t have much competition for tackles in New Orleans and will therefore remain a solid linebacker next year. 17. MLB Stephen Tulloch (TEN) – Tulloch had a fantastic year in 2009 and I expect him to improve upon those numbers moving forward in his career now that he is the main, three-down linebacker in Tennessee. With Keith Bulluck now in New York, Tulloch is the leader of the defense and I expect numbers close to Bulluck's 2002-2006 seasons. 18. MLB Kirk Morrison (JAX) – Morrison getting traded to Jacksonville hurt his fantasy value. The MLB position in Oakland was one of the best spots for fantasy production at that specific position. Jacksonville is a good landing spot, but I don't see Morrison putting up LB1 numbers like he did in Oakland. He still remains a solid LB2 though. 22. LOLB LaMarr Woodley (PIT) – I tend to shy away from players who rely heavily on big plays (e.g. sacks). However, Woodley was an absolute stud the last eight weeks of the 2009 season. During this span, he registered 11.5 sacks. Admittedly, this is somewhat of a high risk/reward pick. Woodley could end up with numbers similar to James Harrison’s 2008 campaign or Harrison could rebound and take away from Woodley’s numbers. August 23 Update: Jackson strained his pectoral muscle and is expected to be out 3-8 weeks and will probably miss the 1st couple games of the regular season. This news is disconcerting since Jackson tore his other pectoral muscle last year and has had troubles staying healthy. I still expect him to be undervalued though. He's ADP is likely to plummet and he may only miss a game or two. I still look for Jackson to be a top 15 LB with upside. If you're in a league that allows you to have a bench or an IR spot for players that are out, Jackson's ranking improves into the 12-15 range. August 23 Update: Henderson posted 7 tackles during his first preseason game and looked to have regained a majority of his quickness and explosiveness. Through his combination of solid tackle numbers and big-play ability, Henderson has LB1 potential when healthy. Broken femurs are not chronic injuries and Henderson should therefore be able to fully recover and move on from that injury. Henderson's one of my favorite value picks this season. 26. 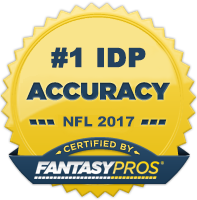 SLB Chad Greenway (MIN) – Greenway, along with Brian Cushing, are oddities in the IDP world because of their solid production at the SLB position. Greenway finished as the 23rd ranked linebacker in my scoring system by registering 99 total tackles, 3 fumble recoveries, and 3 interceptions. I typically shy away from players like Greenway who had a lot of their production as a result of big-plays, but he's proven in his 1st three seasons in the league that he's that type of player. 27 (24). RILB Nick Barnett (GB) – Barnett rebounded nicely from his season-ending knee injury in 2008. Over his seven years in the league, Barnett has proven to be one of the more consistent tackling linebackers in the league by averaging 86 solo tackles and 34 assists. Look for him to continue to perform well in Dom Capers' 3-4 defensive system. September 1 Update: Barnett hasn't been practicing due to knee pain. This is a little bit alarming to me. There are some injuries that linebackers can play through, but knee injuries typically aren't one of them. 29. ROLB James Harrison (PIT) – The one stat that concerns me about Harrison is that he only registered two sacks in the final nine games last season. On the other hand, he did have eight sacks in his first seven games. Even though I believe the LaMarr Woodley has now become THE sack guy in Pittsburgh, I also believe that there are enough sacks to feed Harrison as well. In addition, Harrison tends to generate a good amount of tackles for a big-play linebacker (he's averaged 93 total tackles over the last three seasons) and even though he had an off-year, he still finished in the top 30 linebackers in my scoring system. For more in-depth information on David Hawthorne, click here. August 23 Update: The Seahawks seemed to be running a hybrid version of the 4-3 (which looks quite similar to a 3-4) with an "Elephant" position which is essentially a standup defensive lineman. Hawthorne will slide into the inside during this formation and he should see an increase in tackle numbers. 33. ROLB DeMarcus Ware (DAL) – Ware had his worst fantasy season since his rookie year way back in 2005. Both his tackle numbers and sacks were down compared to previous years. I don't think we'll ever see another 20 sack season out of Ware, but I do expect him to improve upon his 11 sacks from 2009. With the emerging play of LOLB Anthony Spencer, Ware shouldn't have to face as many double teams next season and, consequently, he should see a rise in his fantasy numbers. 36. RILB Stephen Cooper (SD) –I've always been a fan of Stephen Cooper. For the last couple seasons he has been grossly undervalued. He started off the 2009 season with a bang by averaging 9.5 total tackles per game for the first 8 games. He quickly cooled off however in the 2nd half of the season as it appeared fellow linebackers Tim Dobbins and Brandon Siler began more heavily competing with Cooper for tackles. The Chargers have a very young and talented linebacking crew and I'm concerned that Cooper may have a difficult time establishing himself as the focal point of the defense in 2010. September 1 Update: With rookie Donald Butler being placed on IR, Cooper's job and position as the #1 fantasy linebacker is San Diego appears to be safe for this season. For more in-depth information on Lawrence Timmons, click here. 41. ROLB Clay Matthews (GB) – Matthews performed extremely well as a rookie last season. With Aaron Kampman in Jacksonville, Matthews will be the Packers main pass-rushing threat. He's valuable in big-play leagues because of his ability to get to the quarterback. He registered double-digit sacks in his rookie campaign and I see no reason why he can't replicate, if not improve upon those numbers in 2010. 43. ROLB Tamba Hali (KC) - Hali was one of the most underrated pass-rushing linebackers last season (he had a Pro Footall Focus rating of 10.1). I see him on the same upward trend as Dumervil was between the 2008 and 2009 season. Last season, Hali made a higher percentage of his team's plays than Dumervil did, despite the fact that teams ran at Dumervil like it was going out of style. He had more quarterback hits that didn't result in sacks than Dumervil did, with several more hurries. Adding up their sacks, hits, and hurries yields a total of 41 quarterback "incidents" for Dumervil - and 41.5 for Hali. Furthermore, five of Hali's 8.5 sacks resulted in a forced fumble or a safety; only three of Dumervil's 17 sacks did the same. September 1 Update: Hali is classified as DE in ESPN leagues and could very well end up being the top fantasy DL (he was #5 last season). Grab him late and ride him to the championship! 44. LILB Bradie James (DAL) – James has surprisingly been a top 30 linebacker in each of the last two seasons. His overall fantasy numbers were down quite substantially from 2008. However, those 2008 numbers were likely an aberration due to his 8 sacks. James' expected fantasy production should remain relatively consistent with what he did in 2009 which was garner 80 solo tackles, 30 assists, and a couple of sacks. This makes him a reliable low LB3 option. 45 (46). MLB Dhani Jones (CIN) – Jones isn't the flashiest fantasy pick at the linebacker position. However, he does start in the middle of a 4-3 defense which is hard to find this low in linebacker rankings and Jones has actually put up top 30 linebacker numbers in back-to-back seasons. There have been rumors that up-and-coming linebacker Rey Maualuga may take over in the middle. But all indications this preseason indicate that Jones will hold onto his MLB gig throughout the majority of the season. He deserves a spot as your LB3. September 1 Update: In a surprise move, the Giants are playing Bulluck on the strong side (which is actually the weak side in New York's defensive scheme). It doesn't hurt his value as much as you would think it does, however. He's still a serviceable LB4 with LB3 upside. September 6 Update: The Cardinals just placed ILB Gerald Hayes on the PUP list giving Washington the starting SILB job in Arizona. He should play well enough to hold that position for the rest of the year or until he takes over Paris Lenon's weak side position. 49. MLB Dan Connor (CAR) - The season-ending injury to Thomas Davis opens up the door for a fantasy sleeper to emerge in Carolina. That player is Dan Connor. The Panthers are moving Jon Beason to the weak side and inserting Connor in the middle. He would be ranked higher, but he's only a two-down linebacker. Grab this guy late in drafts and enjoy his value. 50 (42). SLB Aaron Curry (SEA) – Curry is one of the better linebacking talents to come through the draft in recent years. However, he struggled to find a role within Seattle's defense and consequently was riding the pine for a large part of many games. The Seahawks have overhauled their coaching staff and I look for them to make every attempt to give Curry close to full-time playing status.